OK, so this is one of those half-baked posts that are the bread-and-butter of most blogs, but I just cannot believe that there’s even a controversy over the miraculous appearance a few years ago in a gallery in San Miguel de Allende, Mexico, of five cases of deeply personal, never-before-seen work by Frida Kahlo. The cases contain more than 1.200 items, including intimate diaries, love letters, and even stuffed hummingbirds that the painter would wear around her neck when posing for her self-portraits. A lot of this material is apparently conspicuously signed with her name in a way rarely seen in any of her other work, its provenance is dubious, to say the least — resting as it does on the claim that the artist gave it to woodcarver who made the frames for her pictures — and it’s never been seen before by anyone in her family, or even by the photographer who photographed a lot of her work while she was still alive. 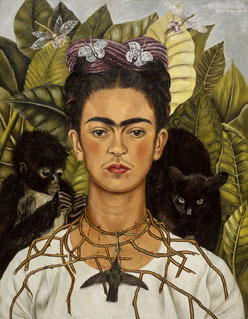 Is it any surprise that most of the leading specialists on Kahlo dismiss the gallerist’s claim to its authenticity? Or that the family-run trust that administers her estate have filed a criminal complaint against him? I’m no specialist on Kahlo and I haven’t seen the lavish coffeetable book on the find, improvidently put out by Princeton Architectural Press, so I’m clearly not particularly qualified to comment. But I have looked at my share of Kahlo’s work in the original, and from the few pictures from the book posted online, there’s no doubt in my mind that this is a hoax. The New York Times has an instructive series of comparative photographs up, which speaks volumes. 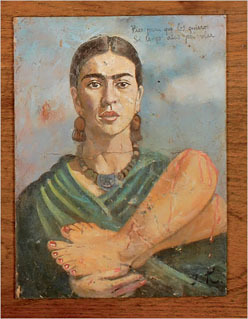 An authentic drawing compared with a feeble imitation, assertively signed ‘Frida Kahlo’ across the bottom, an authentic, evidently spontaneously composed letter next to an assiduous yet weak approximation that — naturally — focuses on Kahlo’s famous lover, Trotsky, placing his name inside a skull, or a Roman fresco-styled portrait transforming her inquisitive, iconic approach to self-portraiture into prettified gloss. Naturally, these items will have to be considered in the flesh by one or more impartial connoisseurs and technical analysts, but really, it seems to me that anyone who has had any experience assessing the authenticity of works of art would smell a rat even from a cursory glance at these images.